As Caravan Of Migrants Heads North, Trump Threatens To Close Southern U.S. Border Hundreds of people have arrived at a Guatemalan town just across the border from Mexico. It's uncertain how Trump would block the group from crossing at a legal port of entry. Honduran migrants walk toward Tecún Umán, a Guatemalan town along the Mexican border, as they leave Guatemala City on Thursday. 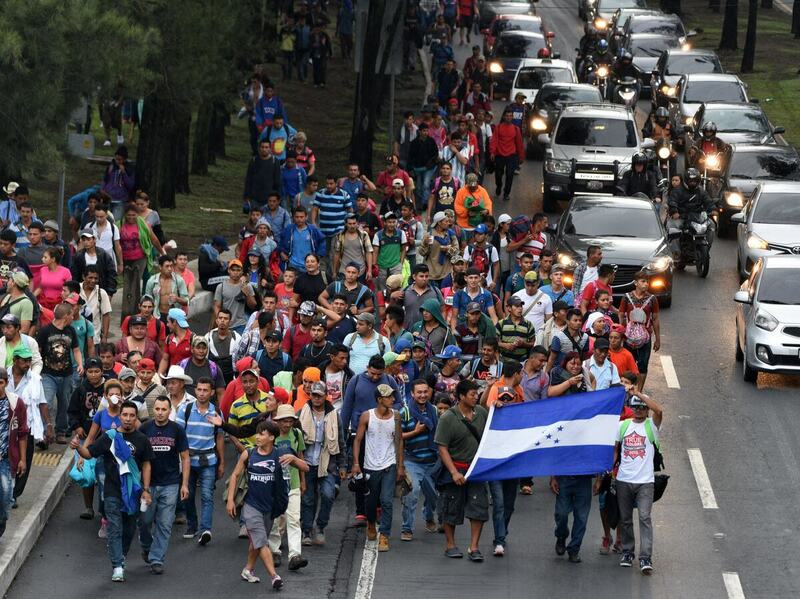 A large group of mostly Honduran refugees, reportedly numbering into the thousands, has crossed into Guatemala in a caravan that is believed headed to the U.S. border. 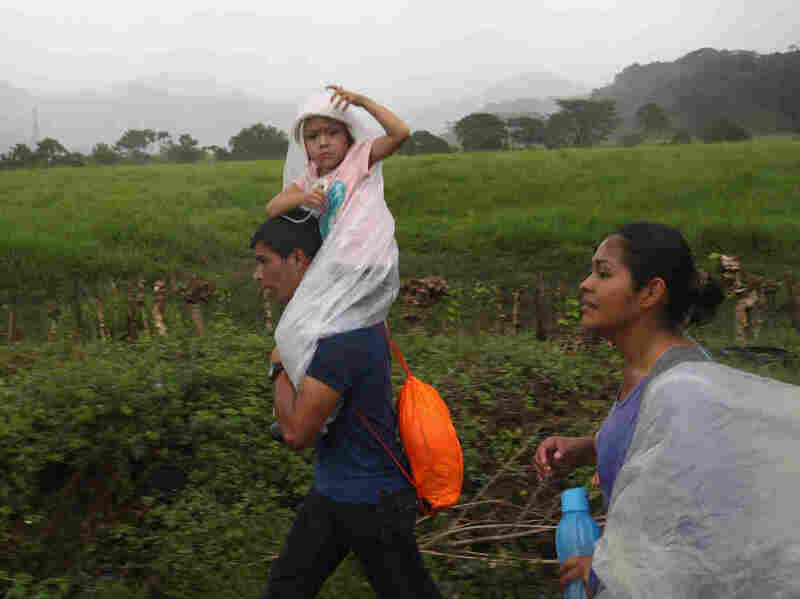 Hundreds of migrants have arrived at the Guatemalan border town of Tecún Umán, along the southern border of Mexico, James Fredrick reports for NPR. Organizers of the caravan say they are waiting for thousands more to join them in the coming days, before attempting to cross the Mexican border. Mexico has ramped up security along its southern border and says that only migrants with valid paperwork will be allowed to enter Mexico — namely, a passport, which most of those in the caravan do not have. "You can tell Mexican security forces are preparing because there are dozens of police in riot gear waiting here for the imminent arrival of this caravan," Frederick told NPR, while standing on a bridge that links Mexico and Guatemala. Most of those who had gathered were from Honduras, he said, but there were also people from El Salvador and Guatemala. Judy, a 34-year-old woman in the group who requested that her last name not be used, said that her home country of Honduras has become very dangerous: no safety, jobs, and the hospitals lack medicine. Basic freedoms are being oppressed by the government of Juan Orlando Hernández, she said, and Honduras simply feels unlivable for her right now. Mexico's interior ministry said it would ask the Office of the United Nations High Commissioner for Refugees for support, as it prepares to receive possibly thousands of refugee requests in the coming days. The Mexican government says that the migrants may apply for asylum in Mexico, but that they'll have to do so from a detention center. Mexico warned that if migrants are caught crossing illegally, they will be detained and deported. With the midterm elections in the U.S. just weeks away, President Donald Trump kept immigration front and center, by threatening to close the entire U.S. border with Mexico to prevent the migrants from entering. "I will call up the U.S. Military and CLOSE OUR SOUTHERN BORDER!" he tweeted Thursday. In the spring, Trump tweeted angrily when an earlier caravan of Central Americans made their way through Mexico with the intention of crossing into the U.S. He threatened to cut foreign aid to Honduras and send the military to the border. In the end, some of the migrants went home and a few hundred crossed the San Ysidro port of entry, south of San Diego, and requested asylum. It's uncertain how the president would block the current group of immigrants from crossing at a legal port of entry. Longstanding federal and international laws allow immigrants to present themselves at a border crossing and seek protection as refugees. They are referred for a "credible fear" of persecution or torture screening to an asylum officer, who decides if they should be deported or continue the asylum process. People in a migrant caravan make their way towards the border with Mexico on Thursday in Siquinalá, Guatemala. Recent presidents, including Trump, have deployed National Guard troops to the southwestern boundary to assist Border Patrol in catching and processing unauthorized immigrants. But they have not blocked the ports of entry, which are under the control of agents from U.S. Customs and Border Protection. President Woodrow Wilson sent active-duty troops to the border during the Mexican Revolution, roughly 100 years ago, to stop raiders such as Pancho Villa from crossing into border states. Today, the migrants Trump wants to keep out appear to be mainly young Hondurans, including parents with small children, who are seeking asylum in the United States. Trump tweeted there are "MANY CRIMINALS" in the caravan, without providing evidence. Trump has long maintained that "catch-and-release loopholes" in U.S. immigration laws lure immigrants here from Central America. The Department of Homeland Security is compiling year-end figures for apprehensions at the southern border. DHS Spokeswoman Katie Waldman wrote in an email to NPR that the department's totals will likely show "record numbers of families arriving illegally in the United States this year." While thousands of immigrant families are being arrested at the border every week in places like Texas' Rio Grande Valley and Nogales, Arizona, the numbers are still far below the peak in 2000, when 1.6 million unauthorized immigrants were arrested. The difference is that the big numbers 18 years ago were mainly single Mexican males who were quickly deported, whereas the current surge is primarily made up of families seeking amnesty, which allows them to remain in the U.S. for months or years while their case grinds through the backlogged immigration courts. Waldman added that the agency "is examining all options to secure the border."